In 1819, Isaac Harby’s private academy had about 90 students, 66 of whom were Jewish. His pupils included the sons and daughters of Charleston’s social elite and a number of indigent youngsters sponsored by the Hebrew Orphan Society. Between January 1819 and May 1820, Harby took in $1,425 in tuition, mainly in cash but also in barter—paper goods, cologne, hats, fine linen. The Gordian Knot, Harby’s second play, was a fiasco when it opened in 1810. Alberti, his third theatrical effort, fared better. President James Monroe, visiting Charleston in April 1819, attended its second performance—three years after Harby had written then Secretary of State Monroe his “portion of the People” protest. 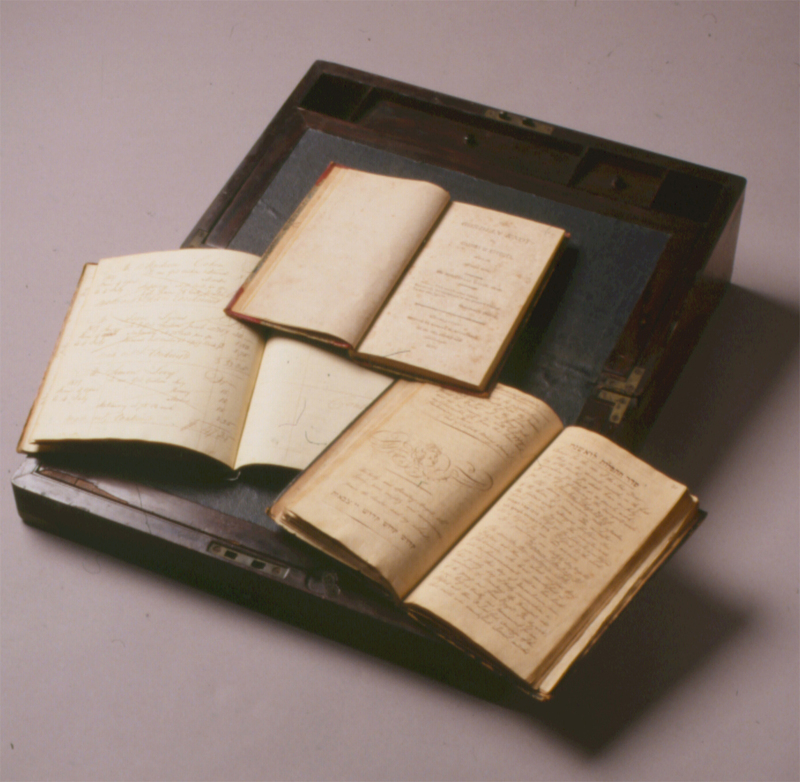 Some of Isaac Harby’s hand-written prayers were incorporated into the first Reform prayer book published in America. Penned in English and Hebrew and illustrated with decorative symbols, Harby’s short, simple verses exemplify the reformer’s creed. His inclusion of a prayer composed by his sister Caroline de Litchfield Harby marks the first step in American Judaism toward incorporating women’s voices into Sabbath worship. The writing desk bearing the nameplate “A. Moïse, Sr.” may have belonged to Aaron Moïse, second son of Abraham and Sarah Moïse. Aaron was eight years old when his family fled Santo Domingo in 1791. In Charleston he studied medicine but went into banking as a profession. It is also possible that “A. Moïse, Sr.” was Aaron’s father Abraham, progenitor of the Moïse family, whose eighth child and namesake, Abraham Moïse, Jr., became Isaac Harby’s closest associate and biographer. The first of the Moïse clan to become a lawyer, Abraham, Jr., served as justice of the peace from 1827 to 1840 and magistrate from 1842 to 1859. In 1824, under the tutelage of Isaac Harby, 11 years his senior, Abraham wrote a petition outlining “a system of rational religion; of substance, not form.” When the trustees of Beth Elohim rejected the appeal, Moïse wrote the constitution of the new Reformed Society of Israelites.